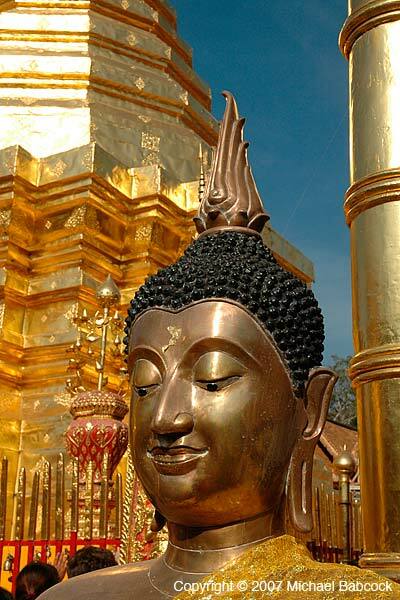 Kasma says that there’s a Thai saying to the effect that anyone who goes to Chiang Mai and does not visit the temple Doi Suthep has not visited Chiang Mai. Situated on a hill, you must climb numerous steps to reach the temple grounds, though there’s a skytrain if you don’t want to walk up. This is a Buddha statue found in the main temple area at Doi Suthep – you can see the tall Chedi (the Thai word for stupa) in the background to the left. I enjoy going to temples and enjoy the numerous representations of the Buddha. Many of them give you a glimpse of the peacefulness allegedly available to one who understands the nature of reality. See also: Buddhism, Thailand, Aachan Chah. This entry was posted on Wednesday, July 8th, 2009 at 12:01 am	and is filed under Thai Culture, Travel, Wednesday Photo. You can follow any responses to this entry through the RSS 2.0 feed. You can leave a response, or trackback from your own site.